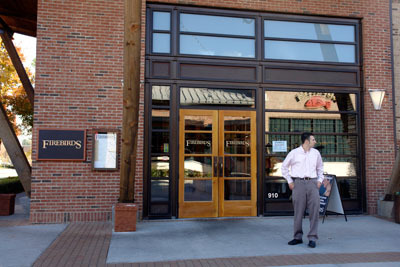 Du-par’s is located at the very nice Southpoint mall in Durham. The restaurant is pretty comfortable and has a western decor. Service was good but unremarkable and a bit slow. They could do with a bit more staff. I had buffalo meat-loaf. 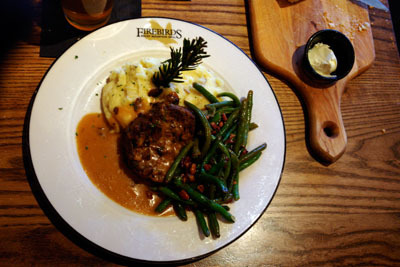 The meat-loaf was served with parmesan mash potatoes and pecan green beans. While the mash potatoes were good, the meat-loaf was too salty and had too much pepper in it. I couldn’t taste the meat… Additionnally the green beans were cold and the gravy was far too salty. It’s pretty hard for a restaurant to mess up meat-loaf but they successfully did it. In one word: a disaster. Around $20, including drinks (beer) and tip. Considering the food, Firebirds can’t be a good value for money. It’s a place that I will definitely avoid.